Neocicada australamexicana Sanborn & Sueur, 2005 is a cicada found in Mexico. There’s a very similar cicada in the United Stated called Neocicada hieroglyphica hieroglyphica (Say, 1830). Neocicada australamexicana was formerly known as Tettigia hieroglyphica. The image says Tettigia hieroglyphica, but the newest name for this cicada is Neocicada australamexicana. Once September rolls around in New Jersey (USA) temperatures start to drop, as do the cicadas. Labor Day weekend is a three day last hurrah for the summer. Folks have barbecues, take one last trip to the beach, or one last fishing trip to the lake. It’s one last chance to have some fun before the kids go back to school, the weather gets too cold to wear shorts, and hurricanes start ripping up the coastline. This past Labor Day weekend I found myself at Washington Crossing State Park in Titusville, NJ. You might have guessed that this park marks the location where founding father General George Washington famously crossed the Delaware River. I think of it was a place to find Neotibicen linnei and Neotibicen winnemanna in the same location. N. linnei and N. winnemanna belong to the “Green Group” of Neotibicen cicadas. All the cicadas in this group look very similar, and you have to tell them apart by their song or key morphological differences. Even with sound files of their songs to reference, photos and notes, telling them apart can be vexing and bemusing. In some cases species mate and form hybrids which make it even more difficult to tell them apart. A is likely an N. linnei, and C is likely an N. winnemanna. See B, if you’re curious. Probably an N. linnei although it lacks the wing bend. More black than beige, although that isn’t always a sure indicator of species. After wandering the park for a few hours I was rewarded with a few dead specimens. One with eggs still stuck to its ovipositor, which was neat to see. I also recorded their calls — unfortunately no hybrids in the mix. Part of the fun of traveling to see cicadas is visiting the place where the cicadas live. Washington Crossing State Park is far from the industry and urban decay New Jersey is known for. If you like scenic rivers, pastoral landscapes, American history, farmers markets, and antique stores, this area is for you. For me, it’s a nice place to observe cicadas. The park features many acres of deciduous and evergreen trees, perfect for cicadas. You can also walk the bridge to the Pennsylvania side of the river, where you’ll find more N. winnemanna than N. linnei. Cicadas will be done mating before the end of September (actual date differs by location), and start dropping from the trees before the leaves being to change color. Go out this weekend and look and listen for the last cicadas of the year. Dorsal view of two latifasciatus males. N. latifasciatus is a cicada found along the east coast of the United States, and is known for its preference for cedar trees. It can be found in New Jersey, Maryland, North Carolina, Virginia2, Florida and points in between3. Its affinity for cedar trees (plus its distinct call) makes it relatively easy to locate and capture — if you’re willing to get a little messy climbing through the thick & sticky branches of a cedar tree. A thin mist of sap from the cedar seems to coat the wings of these cicadas, and it’s worth mentioning that their wings are often torn and ragged, probably resulting from the thick cedar foliage. When William T. Davis first described N. latifasciatus in 19154, he described it as a variety of Cicada pruinosa (now Neotibicen pruinosus pruinosus). This is understandable, since they sound very much alike, and look alike except for the the white bands on the sides of the latifasciatus, some other minor morphological differences, and habitats. pruinosus, latifasciatus, winnemanna, linnei, canicularis, and robinsonianus are collectively known as the Green [Neo]tibicen Species3 or simply “the Green Group”.They’re called Green because much of their heads, collars, pronotums and mesonotums are green in color. On Saturday, August 20th, 2016, I met Elias Bonaros and Annette DeGiovine-Oliveira in Middle Township, Cape May County to search for latifasciatus. I arrived before they did and located a relatively quiet road lined with cedar trees, filled with screaming latifasciatus. From the outside cedars resemble twisting green fire; on the inside they’re a mess of tightly-packed, dirty branches — perfect for an insect to hide. The road and trees were surrounded by briny marshland, less than a mile from the Atlantic Ocean. Other than cicadas, there were an abundance of annoying greenhead flies (Tabanus nigrovittatus), and not annoying at all katydids. The temperature was in the mid 80s, the air was humid, the sun was brutal, and the flies thought I was delicious. In the 5 hours we spent photographing and gathering specimens, I drank a gallon of water. Elias handled cicada procurement duties, and Annette and I recorded the cicadas’ song and habitat. After a satisfying lunch, I went looking for other locations and found a very different but prime in-land location with taller cedar (Red and White varieties) in Woodbine Borough. There we found many exuvia, which we did not find at the other location, and heard not only latifasciatus, but also N. linnei, N. tibicen tibicen, N. canicularis, and N. auletes. Around 9pm, and almost 12 hours of cicada field-work, I called it quits. Elias and Annette stuck around and were able to observe molting latifasciatus. 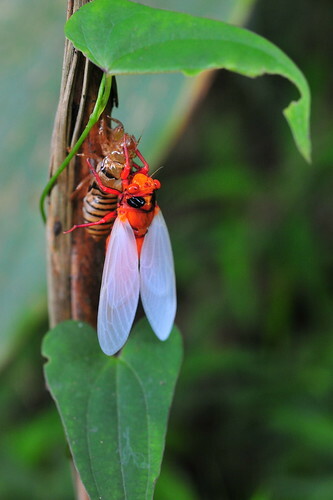 This cicada was captured using the “clap” method of netting cicadas. This method involves two people using two nets, surrounding the cicada so it can’t find an escape path. I would be remiss if I did not mention how delightful the people of Cape May County are. All the folks we encountered were pleasantly curious or encouraging about our cicada research activities. They also have “Custard” shops instead of Ice Cream shops. Also check out Annette’s YouTube channel for video of the latifasciatus habitat and song. 1 Sanborn AF, Phillips PK. 2013. Biogeography of the Cicadas (Hemiptera: Cicadidae) of North America, North of Mexico. Diversity 2013, 5, 166-239. 2 Sanborn AF, Heath MS. 2012. The Cicadas (Hemipetera: Cicadoidea: Cicadidae) of North America North of Mexico. Entomological Society of America. 45. 3 BugGuide Species Neotibicen latifasciatus page. This female Neotibicen lyricen engelhardti aka Dark Lyric Cicada was found during my lunch (half) hour in Middletown, NJ (95ft elevation). Yes it is covered with ants. More information about N. lyricen engelhardti. Elias Bonaros shared these photos of Neocicada hieroglyphica that he observed emerging in Riverhead, Long Island, New York, which is the north-most point of their range, as documented by William T. Davis. They were taken today, July 13th, 2015. Here is the Neocicada hieroglyphica hieroglyphica exiting its nymphal skin. Annette DeGiovine wrote an extensive blog post with many images and video of emerging Neocicada hieroglyphica. Check it out. Brood I Magicicada periodical cicadas continue to emerge in VA, WA and TN. Magicicada stragglers belonging to other broods, continue to emerge as well. Neocicada hieroglyphica are around as well, particularly in Florida [link goes to image]. Example of a Neocicada hieroglyphica. Cicadas belonging to the genus Cacama (Cactus Dodgers), including the Cacama valvata are emerging in south-western states like New Mexico and Arizona [link goes to image]. Cicadas belonging to the genus Tibicen are emerging in warmer areas of the United States. Joe Green found a Tibicen tibicen (possibly Tibicen tibicen australis [see Insect Singers site for song and description]) in Florida. Tibicen superbus [image] are emerging in Southern states as well. Cicadas belonging to the genus Platypedia are emerging in Califorina [link goes to image]. See also Hello, my tree is clicking. Cicadas belonging to the genus Okanagana are emerging in California [link goes to image]. H is for Hieroglyphic Cicada. The Neocicada hieroglyphica a.k.a. Hieroglyphic Cicada is found in the south-eastern United States. It’s active in the late spring and early summer. 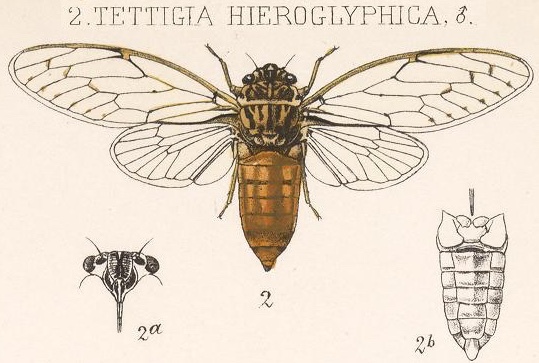 There are multiple subspecies of the Hieroglyphic Cicada including the Neocicada hieroglyphica hieroglyphica and Neocicada hieroglyphica johannis, according to InsectSingers.com. Neocicada hieroglyphica singing by Joe Green from Cicada Mania on Vimeo. Haemolymph is a blood-like fluid found in some arthropods like cicadas. Cicadas use haemolymph to inflate their wings when they eclose (leave their nymph form and become adults), as well as to transport nutrients throughout the cicada’s body. Harvest Fly is common name for Tibicen cicadas, presumably in areas where harvests take place. I’ve heard tales that the harvest is supposed to take place a month after the last Tibicen sings. Kathy Hill is a cicada researcher who is “working on descriptions of new species of cicadas from New Zealand, Australia and North America, several discovered through recognition of their unique songs” (quoted from Kathy and David Marshall’s wonderful InsectSingers.com website). Kathy is responsible for this unbelievable photo of 18 different USA Tibicen specimens. Huechys sanguinea is a beautiful black and red cicada from Asia. Here’s a photo of a Huechys sanguinea: (Photo by Huechys sanguinea by =spurdog=, on Flickr). Hot weather means cicadas emerge sooner? Most likely. Temperature is a factor influencing when cicadas will emerge from the earth and enter the adult phase of their lives. Cicadas like warm weather (as do most insects) and so once the soil & air reaches a temperature that pleases the cicadas, they will likely emerge. There are other factors of course, but hotter weather usually means cicadas will emerge sooner than later. The spring and summer of 2010 have been HOTTER than usual in the mid-Atlantic area of the United States, and so species of cicadas are emerging earlier than expected. Since June first, I’ve witnessed, 32 days above 80F(27C), and 11 days above 90F(32C), in New Jersey, which is warmer than usual. Annual cicada species like the Tibicen species and Neocicada hieroglyphica have been emerging sooner than expected. Cicadas.info has reports of Neocicada hieroglyphica, Tibicen lyricen and T. tibicen (T. chloromera) emerging sooner than expected. I’ve been hearing T. linnei in New Jersey since June. Massachusetts Cicadas is reporting a slow start for Tibicen. Massachusetts is a New England state and is typically cooler than Mid-Atlantic states like New Jersey, but that might not be the only factor at work here. It will be interesting to see how this plays out. The temperature will also affect when a cicada will sing: if it’s too cold cicadas won’t sing, and if it’s too hot the poor over-heated cicadas won’t sing. This is why you won’t hear some annual cicadas singing on a cool day, or when it’s near 100F(38C). This depends on the species too; some species like it HOT, and some like it cool. I’ve also heard that temperature can affect the frequency of a cicada’s song, however, there is not a formula that allows to you determine the temperature based on the pauses in a cicada’s call like there is for crickets. Here’s a cool photo of a Neocicada hieroglyphica found by Matt Berger on top of a rocky ridge in the Red River Gorge in Kentucky. Read all posts featuring Neocicada photos and video. Joe Green wrote us to let us know that he heard the first Neocicada hieroglyphica of the year. Just wanted to let you all know I heard the first male Neocicada hieroglyphica calling from a oak tree today at Chico’s World Headquarters campus here in Fort Myers, Florida. I heard the warm-up pre call at first that lead into to the full blown chorus call for 6 repeated calls before he stopped. It was 2:40 pm EST, in the afternoon with the temperature reaching 80 degrees on this day. I have yet to hear one at Dusk here at the house but I’ll listen from now on with the start of the season here in south Florida and record all my data for this year’s research. I’ll keep in touch with all of you as the year proceeds. 18 photos of Neocicada hieroglyphica.